The detailed download instructions for the library can be found at the official link. I would suggest that you install the TextBlob library as well as the sample corpora. Let's now see the different functionalities of the TextBlob library. Next, you need to define a string that contains the text of the document. We will create string that contains the first paragraph of the Wikipedia article on artificial intelligence. The next step is to pass this document as a parameter to the TextBlob class. The returned object can then be used to tokenize the document to words and sentences. In the output, you will see the tokenized sentences along with the number of sentences. Similarly, the words attribute returns the tokenized words in the document. Lemmatization refers to reducing the word to its root form as found in a dictionary. To perform lemmatization via TextBlob, you have to use the Word object from the textblob library, pass it the word that you want to lemmatize and then call the lemmatize method. Like the spaCy and NLTK libraries, the TextBlob library also contains functionalities for the POS tagging. The POS tags have been printed in the abbreviation form. To see the full form of each abbreviation, please consult this link. Noun phrase extraction, as the name suggests, refers to extracting phrases that contain nouns. Let's find all the noun phrases in the first paragraph of the Wikipedia article on artificial intelligence that we used earlier. You can see all the noun phrases in our document. In a previous section, we used Python's built-in len method to count the number of sentences, words and noun-phrases returned by the TextBlob object. We can use TextBlob's built-in methods for the same purpose. To find the frequency of occurrence of a particular word, we have to pass the name of the word as the index to the word_counts list of the TextBlob object. In the following example, we will count the number of instances of the word "intelligence" in the first paragraph of the Wikipedia article on Artificial Intelligence. Like word counts, noun phrases can also be counted in the same way. The following example finds the phrase "artificial intelligence" in the paragraph. In the output, you will see 2.
text = "I love to watch football, but I have never played it"
N-Grams refer to n combination of words in a sentence. For instance, for a sentence "I love watching football", some 2-grams would be (I love), (love watching) and (watching football). N-Grams can play a crucial role in text classification. This is especially helpful when training language models or doing any type of text prediction. text = "I love to watchf footbal, but I have neter played it"
In the output, you will see es, which stands for the Spanish language. The language code for all the languages can be found at this link. TextBlob also provides basic text classification capabilities. Though, I would not recommend TextBlob for text classification owing to its limited capabilities, however, if you have a really limited data and you want to quickly develop a very basic text classification model, then you may use TextBlob. For advanced models, I would recommend machine learning libraries such as Scikit-Learn or Tensorflow. Let's see how we can perform text classification with TextBlob. The first thing we need is a training dataset and test data. The classification model will be trained on the training dataset and will be evaluated on the test dataset. The dataset contains some dummy reviews about movies. You can see our training and test datasets consist of lists of tuples where the first element of the tuple is the text or a sentence while the second member of the tuple is the corresponding review or sentiment of the text. To train the model, we simply have to pass the training data to the constructor of the NaiveBayesClassifier class. The class will return an object trained on the dataset and capable of making predictions on the test set. It looks like a negative review. When you execute the above script, you will see neg in the output. Similarly, the following script will return pos since the review is positive. You can also make a prediction by passing our classifier to the classifier parameter of the TextBlob object. You then have to call the classify method on the TextBlob object to view the prediction. In the output, you will see 0.66 which is the accuracy of the algorithm. To find the most important features for the classification, the show_informative_features method can be used. The number of most important features to see is passed as a parameter. In this section, we tried to find the sentiment of the movie review using text classification. In reality, you don't have to perform text classification to find the sentiment of a sentence in TextBlob. The TextBlob library comes with a built-in sentiment analyzer which we will see in the next section. In this section, we will analyze the sentiment of the public reviews for different foods purchased via Amazon. We will use the TextBlob sentiment analyzer to do so. The dataset can be downloaded from this Kaggle link. From the output, you can see that the text review about the food is contained by the Text column. The score column contains ratings of the user for the particular product with 1 being the lowest and 5 being the highest rating. You can see that most of the ratings are highly positive i.e. 5. 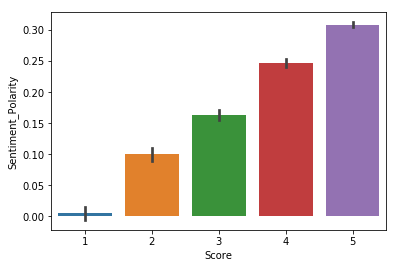 Let's plot the bar plot for the ratings to have a better look at the number of records for each rating. The output shows that more than half of reviews have 5-star ratings. Let's randomly select a review and find its polarity using TextBlob. Let's take a look at review number 350. It looks like the review is positive. Let's verify this using the TextBlob library. To find the sentiment, we have to use the sentiment attribute of the TextBlog object. The sentiment object returns a tuple that contains polarity and subjectivity of the review. The value of polarity can be between -1 and 1 where the reviews with negative polarities have negative sentiments while the reviews with positive polarities have positive sentiments. The subjectivity value can be between 0 and 1. Subjectivity quantifies the amount of personal opinion and factual information contained in the text. The higher subjectivity means that the text contains personal opinion rather than factual information. Let's find the sentiment of the 350th review. The output shows that the review is positive with a high subjectivity. It is evident from the figure above that most of the reviews are positive and have polarity between 0 and 0.5. This is natural since most of the reviews in the dataset have 5-star ratings. 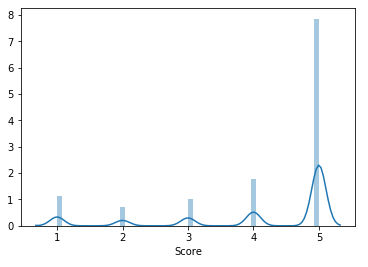 Let's now plot the average polarity for each score rating. 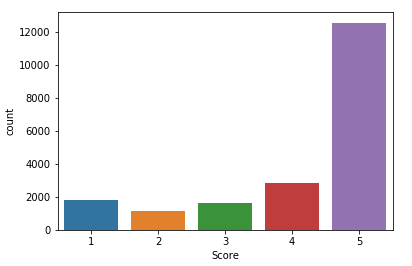 The output clearly shows that the reviews with high rating scores have high positive polarities. Let's now see some of the most negative reviews i.e. the reviews with a polarity value of -1. Let's print the value of review number 545. The output clearly shows that the review is highly negative. "not what I was expecting in terms of the company's reputation for excellent home delivery products"
You can see that though the review was not very positive, it has been assigned a polarity of 1 due to the presence of words like excellent and reputation. 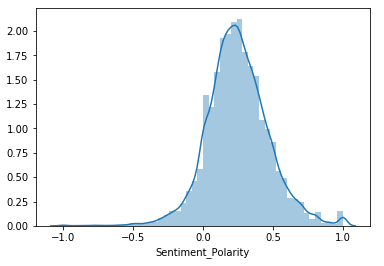 It is important to know that sentiment analyzer is not 100% error-proof and might predict wrong sentiment in a few cases, such as the one we just saw. Let's now see review number 223 which also has been marked as positive. "This is an excellent tea. One of the best I have ever had. It is especially great when you prepare it with a samovar." The output clearly depicts that the review is highly positive. Python's TextBlob library is one of the most famous and widely used natural language processing libraries. This article explains several functionalities of the TextBlob library, such as tokenization, stemming, sentiment analysis, text classification and language translation in detail.